Happy Friday! This week has been so crazy with the fourth. I feel like I am just floating from day to day, haha. My first book for you today is a picture book, sort of! More like an Easy Reader I guess - Cowgirl Kate and Cocoa: Partners! I recently finished No More I'm Done and the author suggested reading this book to introduce the idea of writing partners to the students. Now, I don't know about you, but I find that is WAY more effective to teach things in the context of a read-aloud than it is for me to just sit there and talk at the kids. 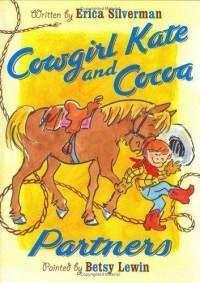 Anyway, this was a cute story about Kate and her cowhorse, Cocoa! There were 4 little chapters in the book detailing different little adventures they had - like trying to find a lost calf and getting new horseshoes for Cocoa. You might want to spread this over a few days, reading a chapter a day, when introducing Read to Someone in Daily 5 or when introducing writing partners, like the book said! My second book for you is a chapter book: Anything But Typical. This story is narrated by a middle school boy with autism. It basically goes through his day to day life, and you get to peek inside the head of someone who lives every day with autism. It was very interesting and eye-opening, especially because I've never worked closely with a student who has autism. I am just in awe of people who dedicate their lives to teaching students with autism - that is such an important and difficult job. The only complaint I had about this book is that the author, Nora Raleigh Baskin, didn't mention how she came to write this book. Does she have a child with autism? Did she ever work with a student who has autism? Or was everything she wrote just based on research? I would have liked to know how true-to-life the story was. Go check out the linky party for other good reads this week! Anything but Typical Sounds like a great read. Never heard of either of them! Now I have to check them out! Anything But Typical sounds like I need to read it before the new school year starts. I bet it's super interesting! Hi Jill! I love the idea of using a book to introduce writing partners and read to someone. What a terrific idea! Thanks for sharing both books as they are both new to me. 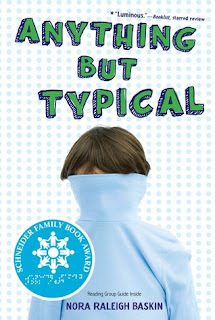 Is Anything but Typical a good book for 4th grade or more of a teacher read? Thanks for linking up! !